MRC partnered with Umeå University (Sweden) and the Centre for Health Research and Training (Sierra Leone) to conduct Ebola research from January to April 2015 in Sierra Leone. The project was funded by the Research for Health in Humanitarian Crises (R2HC) Programme, managed by ELRHA. Using an applied anthropological approach community perceptions on Ebola (Ebola messages, broader Ebola response) were examined. Subsequently a set of gender-sensitive and urban-rural specific Ebola treatment-seeking messages were developed that responded to people’s concerns and indicated the messengers and channels to be used. This process also included field-testing and validation with stakeholders with subsequent refining of the messages. Dissemination to key in-country stakeholders was done through presentation at a NERC daily briefing in March 2015 and in a special meeting in April 2015 at the Ministry of Health and Sanitation. Mobile health: Connecting managers, service providers and clients in Bombali district, Sierra Leone. 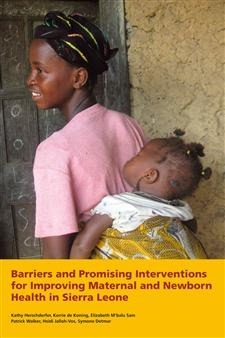 Intervention study on mHealth for maternal and newborn health in resource-poor community and health system settings. Final Report in Book form. This study followed the successful implementation of a first-phase feasibility study, carried out in 2011. The interventions over the 12-month period were divided into two stages of six months each, and were separated into ‘wedges’ according to differential interventions. This step-wedge approach was chosen to create an ‘internal’ non-intervention group (Wedge 2) to compare interventions. Stage 1 interventions (August 2012-January 2013) consisted of the establishment of a virtual private network (VPN) to improve health worker to health worker communication; this was implemented across both wedges, i.e. in all chiefdoms of Bombali district. All 98 peripheral health units (PHUs) also received a mobile phone and sim card that allowed health workers to call numbers in the closed user group network for free. Interventions regarding health worker to client communication and TBA involvement were also started in during this first stage but only in Wedge 1 facilities (Wedge 2 will implement this intervention only during Stage 2, Feb-July 2013) – this may have influenced how both wedges deal with the VPN intervention. In addition, all PHUs in the six chiefdoms included in Wedge 1 received a solar charger for the phone as well as phone credit to call clients, to remind them of appointments; Wedge 2 PHUs did not receive these during the first stage. In one chiefdom in Wedge 1, selected TBAs were engaged and were provided with a mobile phone as part of the intervention, to improve health worker client communication. This will only be started in the one chiefdom selected from Wedge 2 at the second stage of interventions. This report presents the results of the midline study that took place in January-February 2013 at the end of the first stage of interventions. Mixed methods were used for data collection. A quantitative method – consisting of a survey in all 13 chiefdoms – was used to collect background information on one part of the intervention (VPN) and one part of the outcomes (health worker job satisfaction). Qualitative methods were implemented in selected Wedge 1 chiefdoms, and consisted of semi-structured interviews with enrolled clients, TBAs, health workers and health managers, summary information from maternal death reports; and summary information from monthly PHU reports on mHealth enrolment and follow-up (Wedge 1 only). MRC and partners in Sierra Leone and the Netherlands joined forces with the Government of Sierra Leone to investigate and address maternal and newborn health and teenage pregnancy through knowledge sharing, capacity building and the development of interventions. This work is carried out within the Public Private Partnership (PPP) Sierra Leone, one of the programs that make up the MDG5 Meshwork for improving Maternal Health. This report includes the justification, methodology, results and recommendations of a rapid assessment conducted in 2010 that identified factors influencing health seeking behaviour for maternal and newborn health care in Sierra Leone. Beliefs, practices and decision making processes for seeking care for pregnancy, delivery, postnatal and neonatal care and family planning are emerging from this qualitative study carried out in five districts. Interventions and promising practices implemented by the Ministry of Health and Sanitation – with or without nongovernmental organisation (NGO) support – and by local authorities are also identified and assessed based on the perceptions of the users and providers of maternal and newborn health services. This report includes the justification, methodology, results and recommendations of a qualitative study interviewing teenage girls who were pregnant or had been pregnant, and focus group discussions with their peers, elders and leaders in various communities in Moyamba, Kailahun, Kambia and Bo. The report describes the stories of the girls who became pregnant. The reasons for their pregnancy and the consequences of their pregnancy for them, their family and the man/boy who impregnated the girl are described as well. These stories were used in the training of health workers, for the development of a community education strategy. The report formulates implications and recommendations for further policy and strategy development for adolescent sexual and reproductive health in Sierra Leone. The latter are also based on the outcomes of a discussion of implications during a dissemination meeting of the results in Sierra Leone.